Damage prevention and risk mitigation are critical components of any ground disturbance. The Utility Locators support and enhance these objectives through best locating practices and utilizing highly sensitive equipment. Our services include electromagnetic locating, ground penetrating radar and pin-finding for underground utilities. 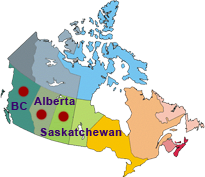 The Utility Locators currently service all areas of Alberta, British Columbia and Saskatchewan - we can go anywhere! The main priority for The Utility Locators is to make your ground disturbance as safe as possible. The identified utilities will be clearly marked on the ground with coloured paint and a corresponding map of the work area will be drawn for the client. The work area is reviewed with the client and a copy of the map is left with them. Please see our Book A Locate page to immediately request an appointment with a locator or for more information.